Comments: An impressive Brussels pieced bobbinlace with bride ground probably around the 1720’s decade, maybe a few years earlier. Borders of this width and length were normally used as furnishing flounces, and this looks like a fairly typical example. The ‘diamond’ compartments in the design is quite unusual, normally these had a vertical symmetry, or a fairly short vertical repeat (look at figures 319 and 320 in Levey – in particular look closely at the caption in figure 319). The weaving in this piece is a little loosely done, and you can see the slightly loose plaiting of the unpicoted brides. A piece like this would have been worked in a factory setting by many different hands, and you can see a little variation in the quality of the motifs. Some of the line-drawing is beautifully done and there isn’t much variation in the fillings. It is a unique survivor. Modifications: Seller cites some tucks made for reshaping, unclear if anything was actually cut in the piece. Ends appear to be cut. Damage: One hole shown in a bottom photo. A few broken brides. Soilage: Looks clean but hard to tell actual color. $402.00, 4 bidders, reserve not met. Comments: A border of Brabant bobbinlace, mid 18th c. Brabant is a term usually applied to what people think was made outside of Brussels, Gent, and other major Flemish centers. It is notable for a combination of brides and 6-pointed star mesh, with rather loosely woven vaguely designed motifs (Levey goes so far as to call them ‘crude’). 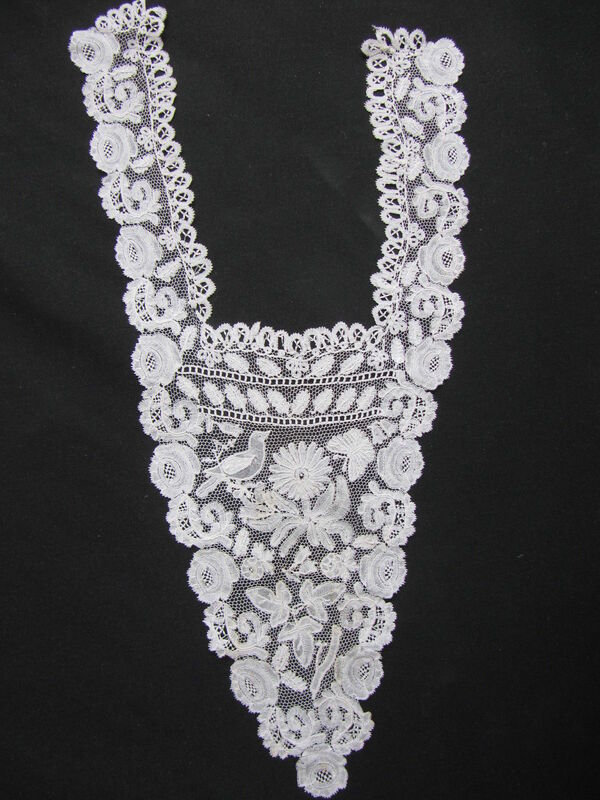 But it’s not all that different from much contemporary Devon lace, and the raised edges, the line drawing in the motifs, and use of snowflake fillings do speak to lacemakers with good technique. I think it’s rather the demands of the market that drive the look of these pieces. This one is an excellent example of the type. Modifications: Cut one end, can’t see the other. Damage: Slight wear with a few small hole sin the mesh, minor. Sold for $875.00, 3 bidders. Comments: An Argentan-style border, made into a lappet. I say ‘style’ because it’s very hard to make exact attributions for the French Normandy needlelaces, there was a lot of interaction between Alençon and Argentan (the much smaller industry). 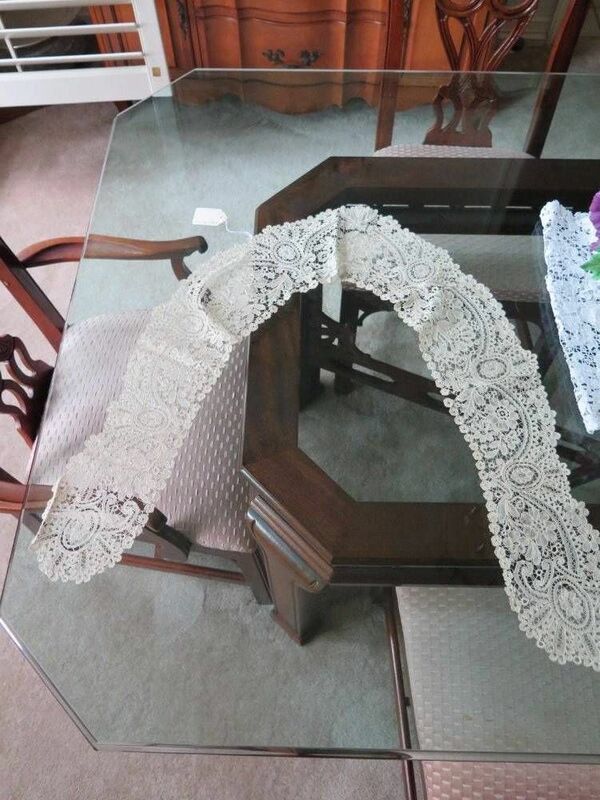 I am unconvinced that this particular lace is an ‘assembled’ piece. Close examination of the photos shows all expected technical process. First the buttonholed ground is worked in the standard three-layer technique. The the toilé is worked. Then the decorative ‘mode’ fillings are added. Finally the ‘brode’, or raised edges, worked again in the standard technique of buttonholing over a free thick thread, which is tacked down with buttonhole stitches at periodic intervals. When I was learning this technique in Alençon I have fond memories of working the brode with the free thread, the buttonhole thread, a horsehair for picots, and replacing a broken working thread with a new one – all keeping track of about 5 different operations at once. But I got through it. Argentan of around the 3rd quarter of the 18th c is distinguished by the hexagonal completely buttonholed mesh, lack of horsehair in the picots, fairly plain design, and not very ambitious fillings, which were influenced by Alençon work. Call it ‘ordinary’ Argentan. There are more complex, rarely seen forms. 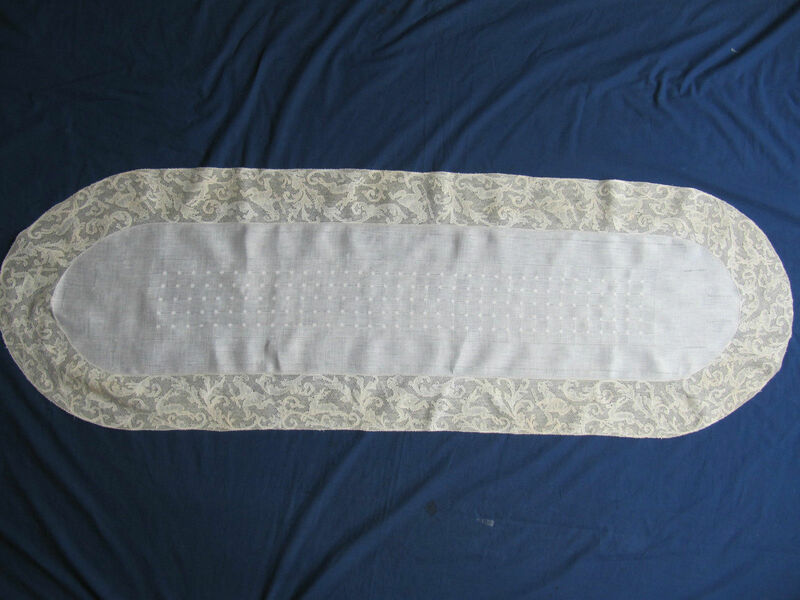 Modifications: A ‘lappet, adapted from a border, cut at the top end. The narrower lefthand side in the photo has been sewn on. Damage: Numerous worn spots, fraying in the mesh, small holes and repairs throughout. Comments: A long Duchesse de Bruges collar. It does have an occasional complex needle-made filling in flower centers. No obvious raised work, and motifs have gimp outlines. 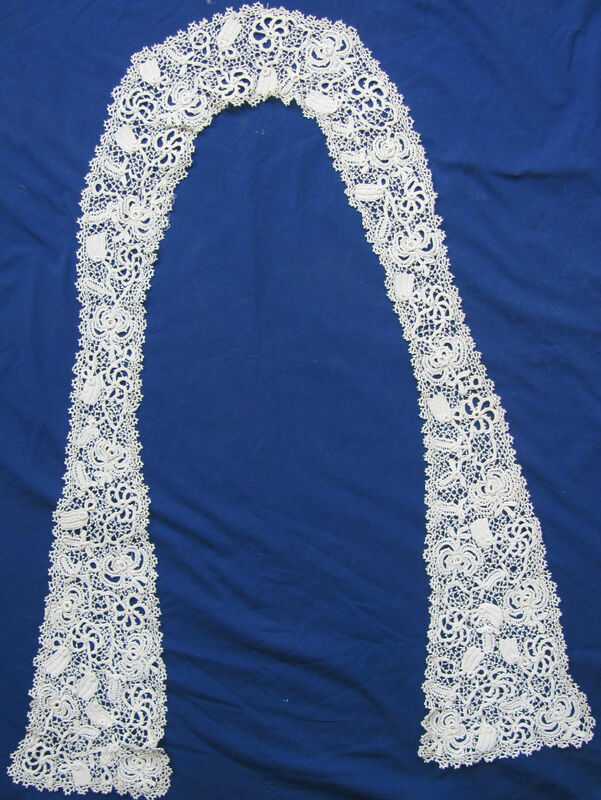 Plaited irregular brides, often with picots. Nice design organization, typical floral and leaf motifs. Damage: A few frayed and broken brides, minor. One edge separation. Finish: Some vertical fold creases, occasional fold along the neckline. Comments: A dress front of Honiton Point (meaning Honiton with a needle-made ground). Note the half-stitch bird with what looks like a raised wing. A fairly complex butterfly is opposite the bird. Well done roses and leaves with good veining. The overall design is a bit puzzling, good work on the outside edges, but the motifs in the middle leave me a little lost. Modifications: None. The square neckline edge looks like a bit of an afterthought. Sold for $102.50, 3 bidders. Size: 20″ across laid flat. 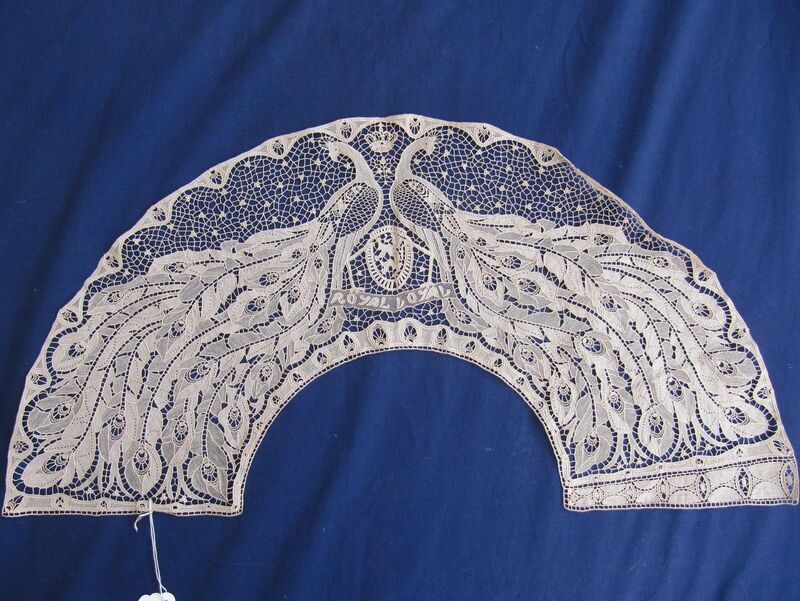 Comments: A needlelace fan with an Art Nouveau design of two peacocks. The date 1916 is worked into the crown at the top, and the Belgian Coat of Arms is in the center of the piece, and it falls squarely in the War Lace category. This very likely is the piece illustrated in the December 1917 exhibition catalog that the seller cites – I’ve compared the two in details and there are just too many similarities in the needlelace, which is difficult to replicate. 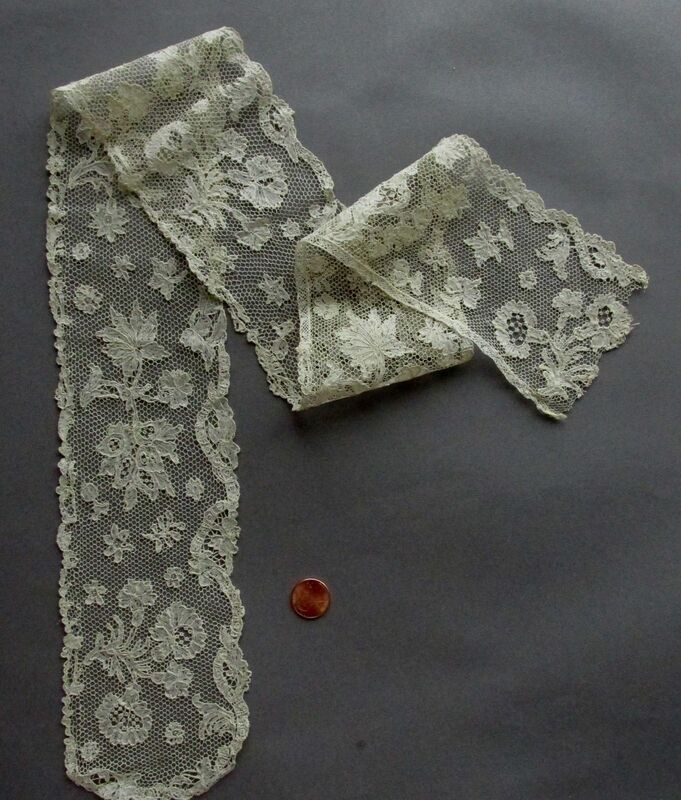 The design of this piece certainly recalls Viennese needlelace of the late 19th c, but close examination shows the widely spaced buttonholed edges typical of Belgian work. I’ve looked at what few books there are that discuss War Lace, and can’t find the Puissant name as a designer. However many of these laces were designed by the Commission for Relief in Belgium committee members, so that is a possibility. I’m also thinking that this is a Zele needlelace piece. Finish: There appears to be some folding along the upper right edge – pattern has disappeared. I hope it’s just a fold. Sold for $2,344.00, 8 bidders. Comments: Table runners like this were usually part of a larger set with placemats, napkins, etc. Point de Paris is a lace that lends itself well to figural work, here a hunter following a stag. This is repeated around the entire edge of the piece, always in the same orientation. The scrolling foliage gives the scene a forest-like appeal. Finish: No obvious creases, a little wrinkled. Sold for $224.00, 1 bidder. Size: 15″ across laid flat. Comments: A Point de Gaze collar, no raised work. Well done decorative ‘mode’ fillings, and the overall floral design is quite naturalistic. Damage: A few loose threads along the neckline, perhaps this was sewn to something at one time. OR there might be some breaks, but photos aren’t close enough to tell. I think I see an occasional pinhole in the mesh, but very minor. Finish: No obvious creases or wrinkles. Looks unused. Sold for $152.50, 7 bidders. Comments: Another Point de Paris edged table linen, this one a small table cover. It is similar in technique to the oval piece reviewed above, and the treatment of the cloth is also very close. I’m thinking these were done by the same manufacturer. 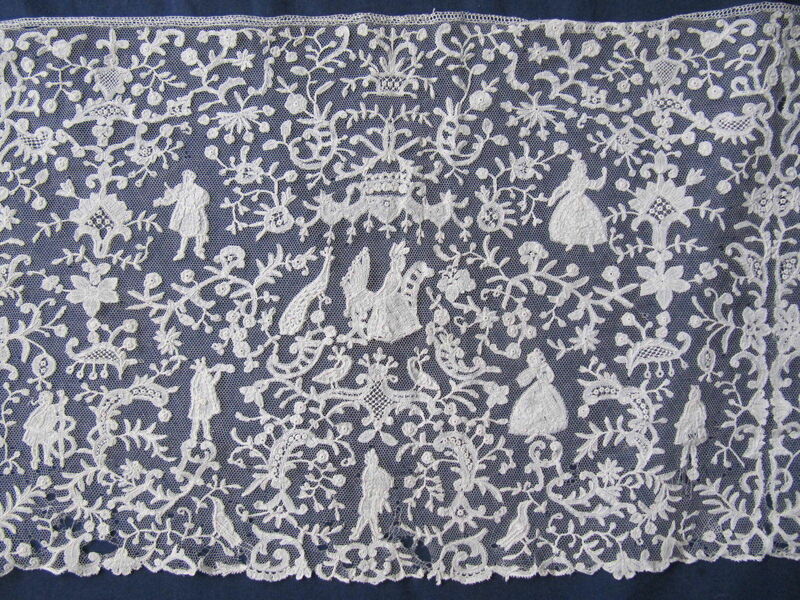 The drawing in the lace is well designed, almost, but not quite a pottenkant design. Finish: Vertical fold creases, and some very slight wrinkling. $111.33, 4 bidders, reserve not met. Comments: A flounce of Brussels bobbinlace applique on machine net. Plate 128 in Margaret Simeon’s book describes it as “Brussels Rosaline Bobbin Lace, with Needlepoint Ground and Fillings. Designs based on Point de France. Late nineteenth century. 34 x 25 cm.” So at least the widths of the two pieces are comparable. You can see where the ‘Rosaline’ comes from since there are perls in some of the small flowers. And the needle-made fillings are later 19th c Belgian techniques, not 18th c.
But what is really interesting is the overall pattern of the listed piece, it repeats about every 34 cm, and if you cut along these divisions and finish the edge a bit, you have exactly what is shown in Simeon. You also don’t often find application pieces with the remaining undecorated tulle at one end. The figural work is what you would expect in late 17th century Berain style pieces, although at that period the ground would have been brides, or perhaps the 6-pointed star. Later on in the 18th c you do see Chinoise pieces with similar figural work, but with a droschel ground. So this is a later copy, and I think it was not meant to be a continuous border, but more meant for separation into smaller pieces. 6/5/15 There has been quite an interesting discussion about this piece going on. 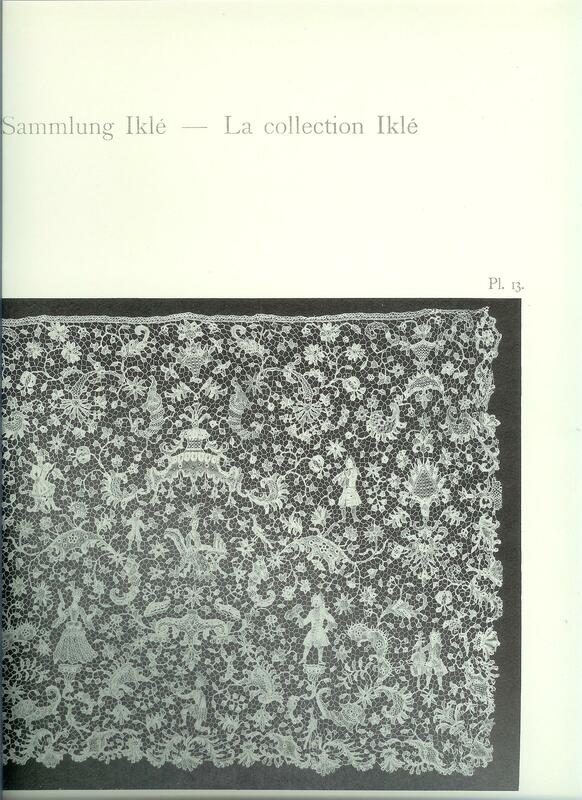 The original late 17thc cravat is shown below in the Iklé collection at St. Gallen. 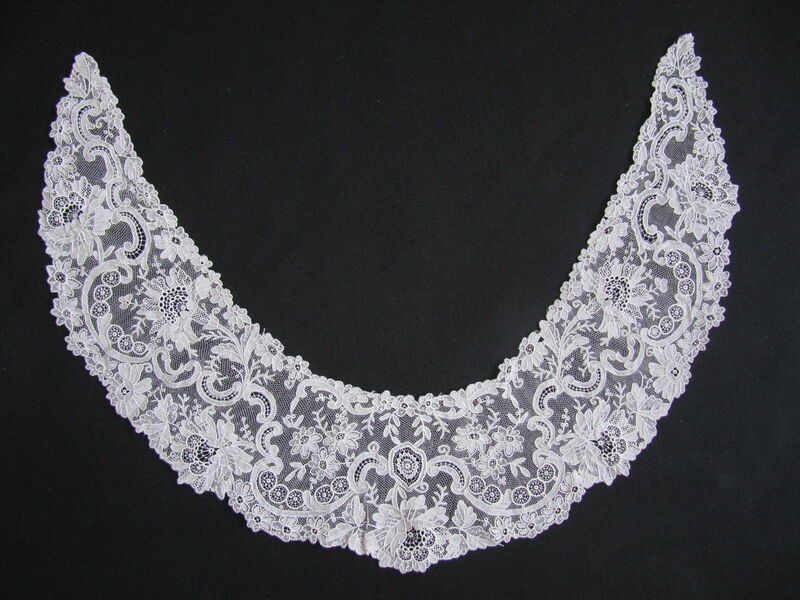 More modern copies (perhaps by the Adolphe Nossent firm) of a single cravat have now been identified in several collections, all in the Point d’Angleterre technique with Point de Gaze ground. The tulle ground of the Ebay piece is quite a surprise. (Thanks to Karen H for wonderful discussion). Damage: Many small holes and pinholes in the tulle. Numerous not very well done repairs. Sold for $1,050.00, 5 bidders. 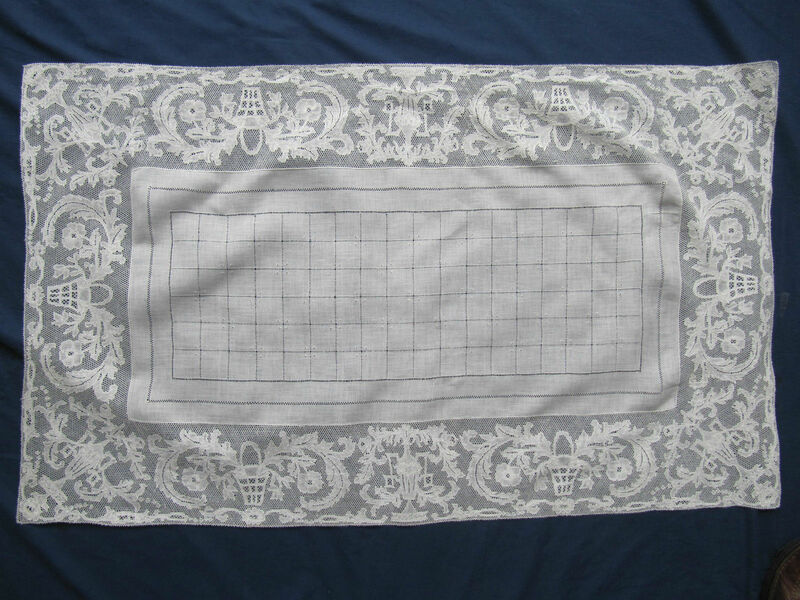 Comments: A table cover bordered with Point de Paris, and a separate border of the same design. The flower basket is in the tradition of Pottenkant design laces. 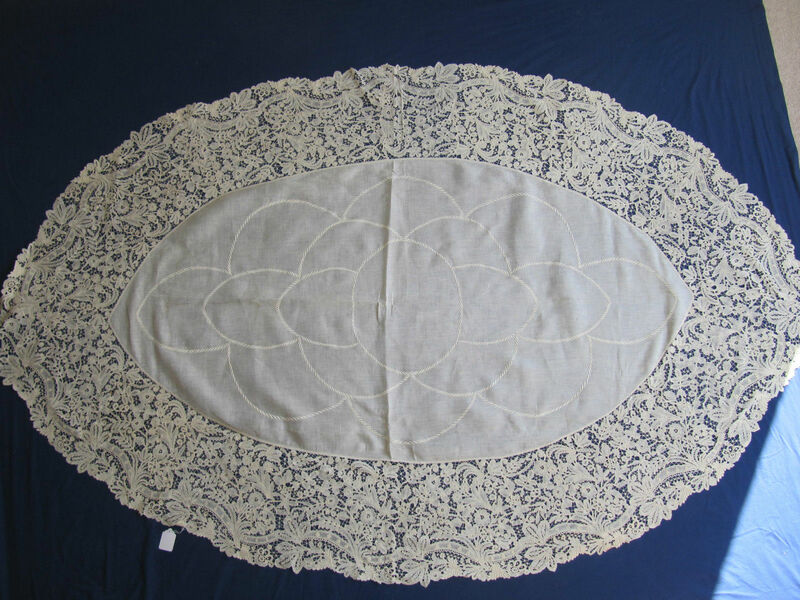 This lace and the treatment of the central cloth in the table cover are again very similar to the pieces reviewed above. Modifications: Table cover OK. Border is cut on both ends. Finish: Probably some vertical fold creases since the lace is wound around a flat card n the photo. $52.00, 3 bidders, reserve not met. $103.50, 4 bidders, reserve not met. Comments: A long collar of Irish Crochet with looped crochet picoted roughly square mesh. Tightly worked motifs, with fairly narrow elements. Raised rings decorate most of the flower centers and bases. Design is a bit crowded. Damage: Occasional break and loose thread along the outer edge. $10.00, 1 bidder, reserve not met. Comments: A table cover edged with Bruges bloemwerk. Note the typical ‘islands’ where the picoted brides meet. There is some raised work on a half-stitch ribbon, which pushes it a bit toward the Duchesse side. The design does a lot with the traditional flowers and leaves of Bloemwerk. Soilage: Light stain in the central cloth. Finish: Fold creases evident, some wrinkling of the cloth. Sold for $310.00, 4 bidders. I was looking for something else when I happened to notice this illustration (see attached scan) in the auction catalogue of the collection of Monsieur Beer, who was a big industrialist in the clothes trade. The auction ran over three days, 25. – 28. June, 1917. 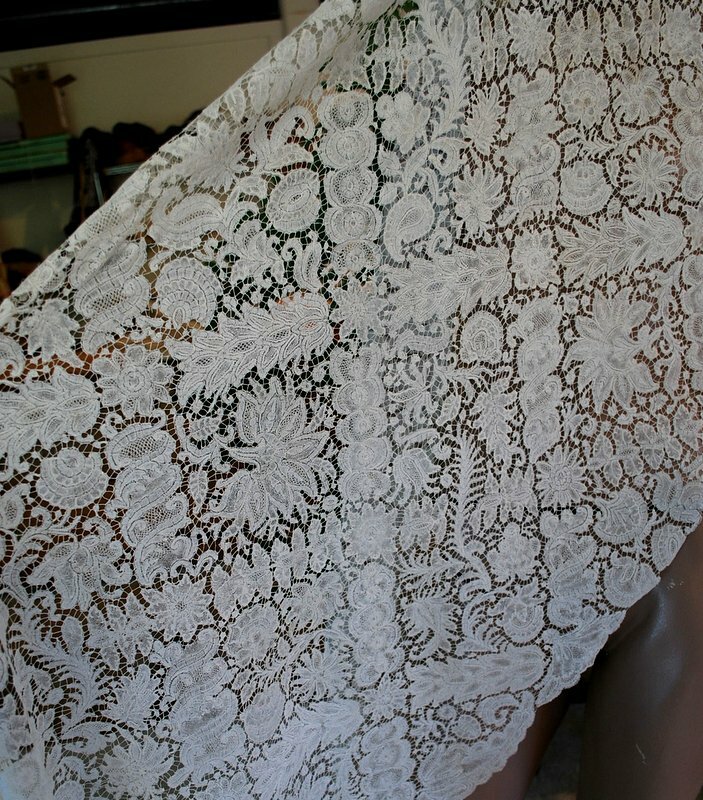 No.162 is of course exactly the pattern of the ‘extravagantly large flemish lace veil’ – which is of course a flounce. I too noticed the quite unusual diaper pattern. the dimensions given in the catalogue are 3.45 m x 0.60 m, which corresponds within 5 centimetres in length with the dimensions given in the eBay auction. So it can very well be the same. Karen HalstrÃ¸m. 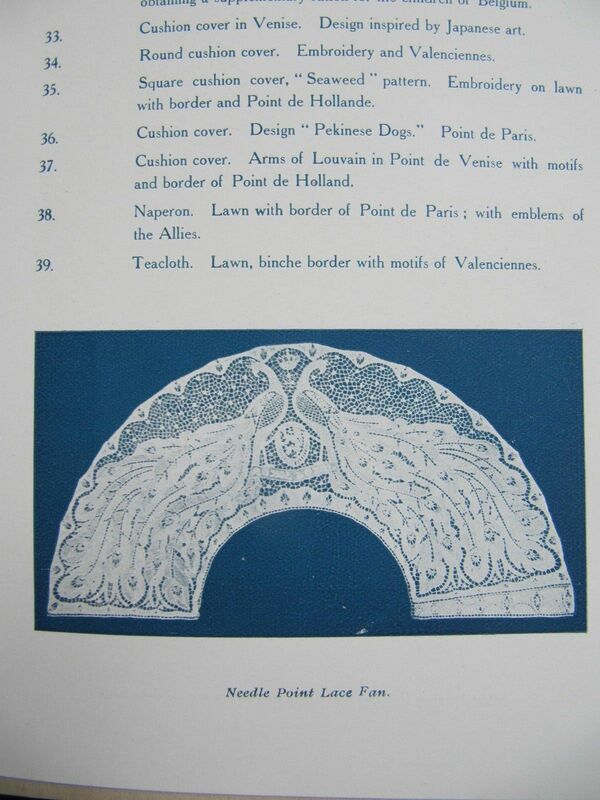 6/5/15 More modern copies (perhaps by the Adolphe Nossent firm) of a single cravat have now been identified in several collections, all in the Point d’Angleterre technique with Point de Gaze ground. The tulle ground of the Ebay piece is quite a surprise. (Thanks to Karen H for wonderful discussion). > Is there a possibility to get more information on Adolphe Nossent? 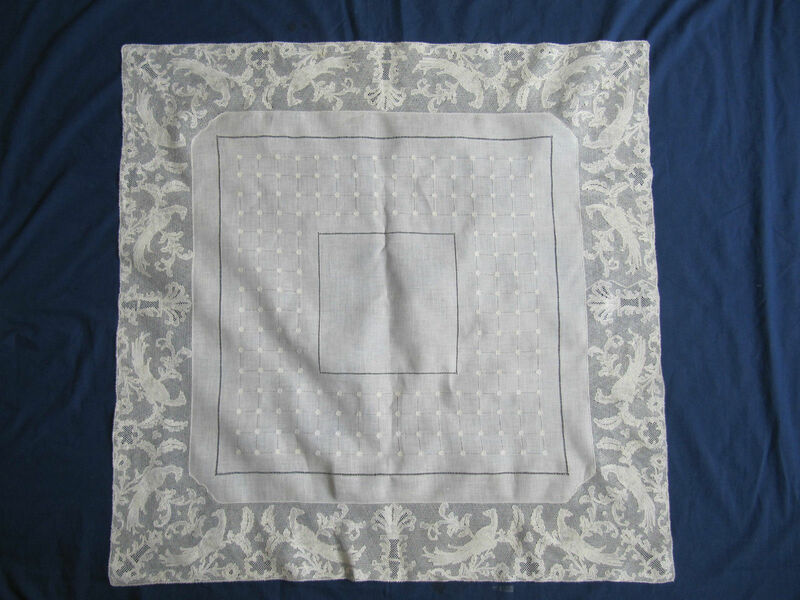 > More modern copies of a single cravat have now been identified in several collections …. Are there photos to see of these modern copies of the cravats? 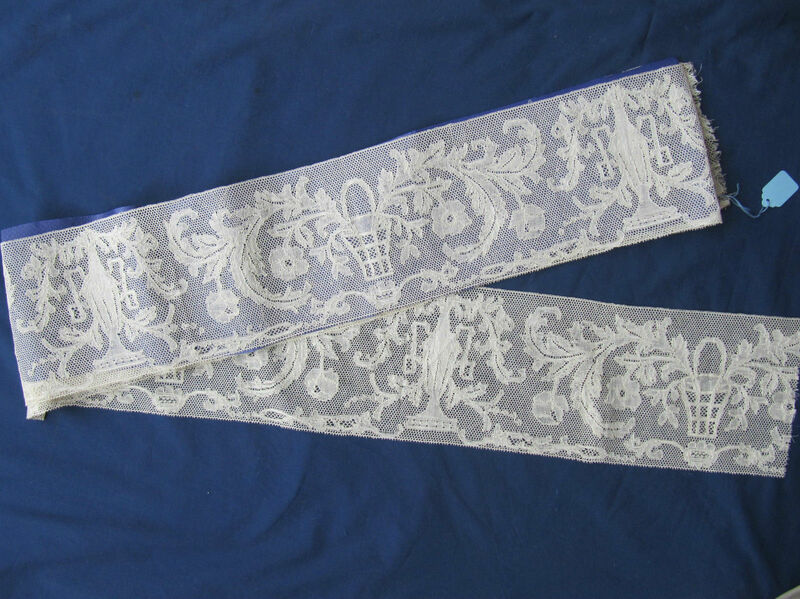 Metropolitan Museum of New York has a cravat with similar design dated 1720-40. 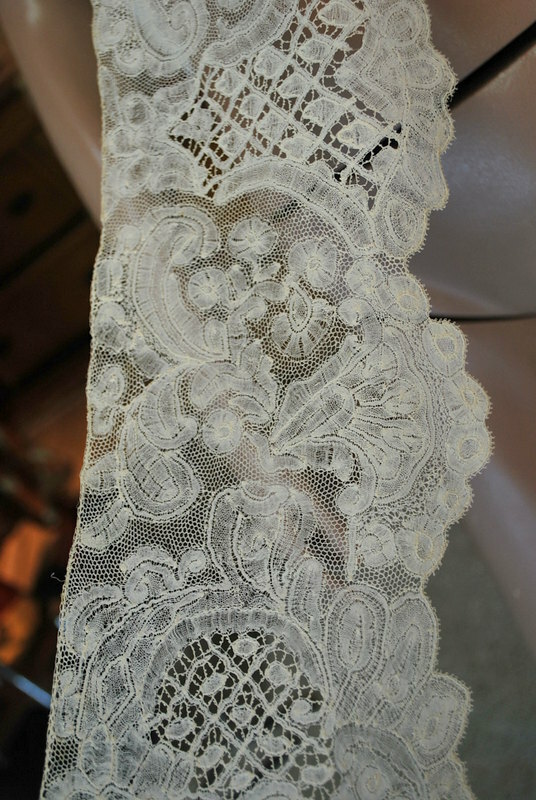 I am the one who bought the lace and would be extremely happy with more information on it.